I did a LOT of community theater growing up. 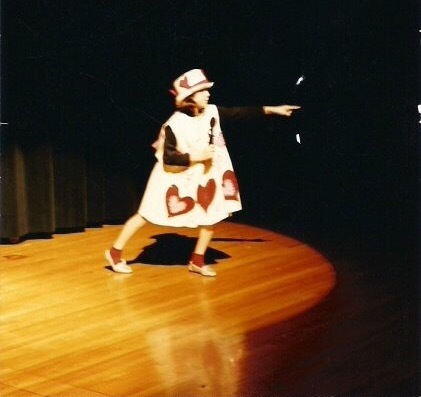 And while I loved most of my roles, few afforded me the opportunity to wear such fabulous costumes as the one I donned while playing the Knave in Alice in Wonderland. You would never have known just how two-faced I really was, though, if all you did was look at my beautiful costume. THIS COSTUME WAS EVERYTHING. The A-line dress with hand-stitched and bedazzled felt hearts. The white top hat with hearts surrounding the brim. The red socks. THE SILVER PENNY LOAFERS. (Those were actually mine.) I mean, come on -- is this costume the most amazing thing ever or what? Cue the spotlight -- singing the opening song as the Knave in Alice in Wonderland. I have definitely worn some incredible costumes over the years, but this is the one that really stands out as my all-time favorite. I just felt so cool the moment I slipped it on. It really helped me BECOME the Knave. 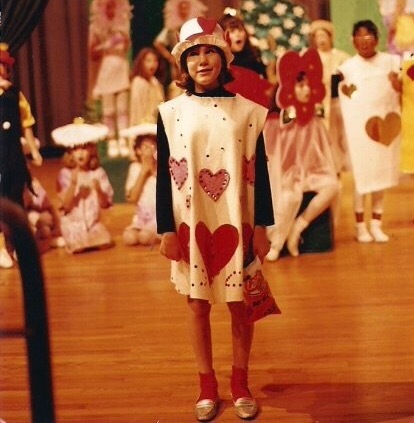 It's a true testament to the fact that what you wear can really influence who you are, how you feel and how you act -- because once I was in that heart-embellished dress, those sugar tarts were MINE! Have you ever worn something that influenced how you acted or felt? Let me know in the comments! You are lucky that you still have your photos of the drama that you've done way back, my camera got stolen so all my photos were also good bye :-( Yeah, those were the days for me it was 16 years ago. Old photos are just the best! These have certainly captured how much fun you had-- the costume is really great! I never really did much theater or acting as a kid (or as an adult now) but putting on my marching band uniform definitely helped get me focus when on my music/shows we were performing! This is great. I love how much you appreciate it too. All my nieces went to theater camp and several went on to local theater plays as well as their high school plays. It gave them so much confidence. Great costume! I love hearts and all things Alice in Wonderland. Since you love music and theater, have you been able to do any as an adult? That costume is too stinking cute. Super cute! The shoes are the perfect addition. Seriously, you're the cutest thing EVER! So cute costume n wonderful post.